It seems that the all-time favorite Pharrell Williams will be hanging up his coat (or should I say his hat) in order to raise money for his children charity. But it’s not just any old hat, it was apart of Vivienne Westwood collection that the ‘Happy’ singer couldn’t resist and was the talk of the town. Sources say that ever since the super-sized fedora made the red carpets, it’s been worn ever since. For example: He wore fashionable for the Grammys, the Brit Awards and the National Basketball Association All-Star game, but is now selling it off for charity, according to the Daily Mail. But Pharrell made it clear that he’s not a materialistic individual. His choice of auditioning off the hat was not only because it caused a huge fuss with fans but he’s hoping he could generate enough money to ‘help change the world one kid at a time by giving them the tools and resources to meet their unique potential’. 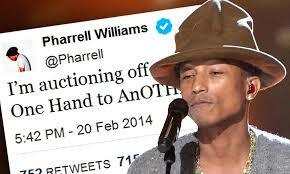 He then posted on twitter: ‘I’m auctioning off my hat from the Grammys to benefit From One Hand to AnOTHER #PharrellsHat @ebay,” with a link to the item for sale’. I would so add my name to that list ha-ha. 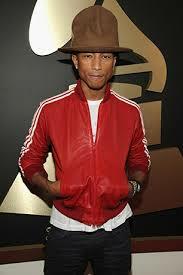 It’s no wonder why most people are obsessed with Pharrell. He’s talented, creative and most importantly caring.